Dog treat fun for everyone! 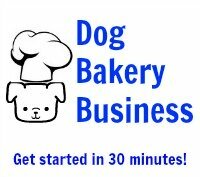 Use dog biscuits to get your dog biscuit business off the ground. Or promote your pet services or a pet service business with homemade dog biscuits. Think about it. Who are you really targeting with your pet service business? The pet? The pet does not care if you are in business. If you are offering treats, the pet will be your best friend...until someone else offers a treat! What you are doing is trying to engage the pet owner emotionally so that he or she will realize that what you are offering can solve a problem for him/her. The pet does not think there is a problem. The key is the "emotional connection". People will do business with other people whom they like, respect, trust, have been referred to, who make them feel good, etc. You also want to be remembered. Dog treats are still a novelty to many people. Believe it or not, there are many who have never heard of a birthday cake for a dog. They laugh about it when shown. But then they want one for their pet! You will stand out from the crowd if you can show them things they never knew existed. Use your homemade dog treats to make that emotional connection. For example, bring homemade dog treats instead of a bottle of wine to a party, especially if the host has a dog. Not only will the host appreciate that you thought of the pet, but the other guests will want to know more about the treats. Be sure to use human grade ingredients and then eat one in front of the guests, while offering them some treats as well. Do the words "homemade chocolate chip cookies" create an image for you? You can smell them and taste them. You know that a homemade chocolate cookie is going to beat out a store-bought chocolate chip cookie that has been mass-produced on any given day. "Homemade" suggests time and effort and care and love. Same goes for a homemade dog treat. You will probably be the only one who ever remembered the dog. A real dog lover will be eternally grateful. Bake a dog cake in the shape of a bone and bring that to the party. It will become the topic of conversation. Bake a flavored one, like the sweet potato cake that we feature on this site. Let the guests taste it so they can see that it isn't made out of a can of dog food. Now you and your cake become memorable - chances are no one else ever served a piece of dog cake. Hint: Bring a bottle of champagne to serve with it. You don't have to be a professional baker or cake decorator. Make up cute dog treats like paw print biscuits. "Paint" the toes with dog treat icing in different colors. Let them dry. Place one in a plastic bag with your dog biscuit business card, a coupon for 10% off for new customers, or anything you like that will have your contact information. Tie the bag with a dog-themed ribbon, or a ribbon matching your business colors. You now have a marketing piece. You can be sure someone is going to enjoy that dog biscuit. It may even be passed on to a friend due to its cuteness! Use these ideas not only to market a dog biscuit business but for other pet related businesses as well. Read "Marketing Dog Treats" to find profiles of small businesses. Read how they got started and what they do to gain customers. I promise to use it only to send you The Dog Treat Icing Newsletter. Save time and energy figuring out ingredients! All natural cake mix for dogs is ready to go! Get started in this lucrative business today! Learn about what you need to succeed from the CEO of K9Cakery who built an award-winning business from scratch, Simply click the image above or this link! 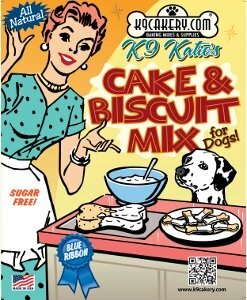 Find all your dog bakery supplies at K9Cakery.com. (C) DogTreatIcing.com 2010-2016 All rights reserved.